It all began at 2am on Friday morning and finished at 6pm on Sunday evening. In that space of time we barely stopped and relaxed but had a blast. The aim of this event was to arrive with your bike, get shipped to the start line and complete 29 sections of cobble (about 55km) and complete a total course of 172km. This should be reasonably handy, logistically, but things are never so good! We arrived at Dublin airport, flew to Brussels, grabbed two trains, walked out of the station and straight across the road into the hotel without a glitch. David actually said, “this is way to good to be true”, and so it began! Our hotel in the background and I’m a few feet from the train! We hopped on the metro which brought us close to the registration point beside the velodrome in Roubaix. We realised it would be busy but an hour later in the queue we were beginning to realise the size of the event. The end is somewhere in the distance! After registration we found our bike hire stand and our bikes. The curse was still in play. My bike was a few sizes too small, as was David’s. “Ah ye will be sound”, said the dude renting bikes, just put the saddles up. Now for those that cycle you will understand, there is alot more to the bike fit than saddle height. As David said, I was like a bull. I didn’t know how I was going to ride 170km over cobblestones on this little nelly, but we had no choice. There were no more bikes to rent. We hit off in the direction of our hotel in Lille, hoping to get home, eat and sleep before a 3am start in the morning. Things are never easy. An hours cycle later we arrived at the hotel. I enjoyed the navigation throught the streets of Lille while cycling with the phone in one hand. I walked in to ask where we could leave bikes for the hotel clerk to say there were no bikes aloud in the hotel. I asked where we could put them, to which they gave me some vague directions. To cut a long story short we bought a big lock, stripped the bikes down to nothing but the frame and brought everything up to the room for the night. The frames stayed attached to a bike rack outside the hotel. We slept for a few hours after a pre race beer (essential). On leaving the hotel, at 3.30am, there were three random bikes in the foyee. If the manager was there at that moment it would of been interesting! Anyway following my little rant about our logistical trouble things began to pick up. Five hours after we left the hotel we were at the staggered start line pumped up by some great music and two fast, strong cups of coffee. We were off and had no clue what we were really getting ourselves into. We had of course done a 15km warm up before catching our bus. It was far easier cycle the streets in the middle of the night though. Two selfies near the start, as if one wasn’t enough!! The race route can be seen on the sign behind me in the next photo. 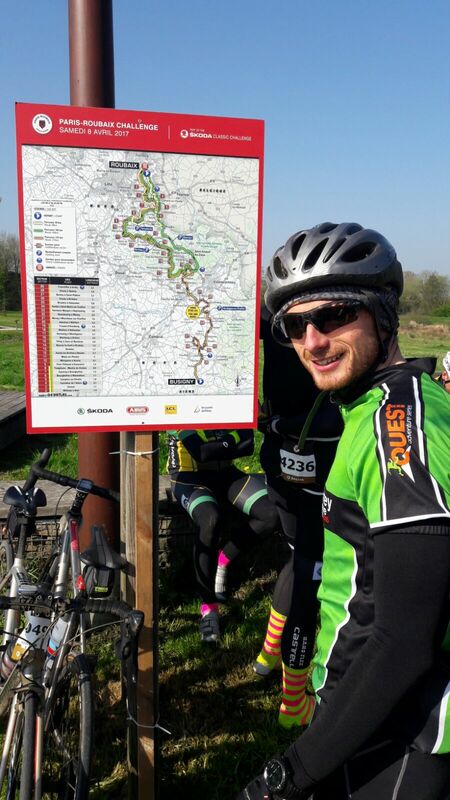 It basically winds through the countryside from a town called Busigny to Roubaix, a total of 172km. The 29 cobble sections are spread out along this route as well as 5000 other cyclists. The route and the sun is out. The photo above was taken at our first food stop, a very welcome breakfast after 7 or 8 hours on the go. The course basically varied between lovely smooth country roads and crazy cobble and the next few photos tell the story. It is very difficult to explain the cobbles unless you actually experience it. Anything over 2km and the arms, wrists and feet start to go numb. You try to relax but the more you relax the more risk of injury with a fall. I saw a few people come off their bikes and I have never seen so many punctures. At one stage I passed a guy with two punctures, not a happy camper. Little villages passed by and we rode through massive open countryside. The TGV train passed by in a blink of the eye and big bunches of cyclists cruised passed us in mini pelothons. We took our time and decided not to race as the experience was what we both wanted. At our second food stop, around the 108km mark we lay down for a well earned rest while eating and stretching a bit. I quickly hopped up realising my top was getting wet and also realising we had lay in a patch of grass most likely used as a toilet in the not so distant past. David didn’t jump up so fast, saying “I don’t care, I’m too tired to care!”. He soon got up, refueled and was back in action. It was about 30km to the next aid station, including 9 sections of cobble, up to grade 4. I was getting used to things now and the body wasn’t in the same shock as earlier in the day. I stopped to strip off a few layers as it was roasting. A few groups of Irish were about on the day and one passed soon after the stop. 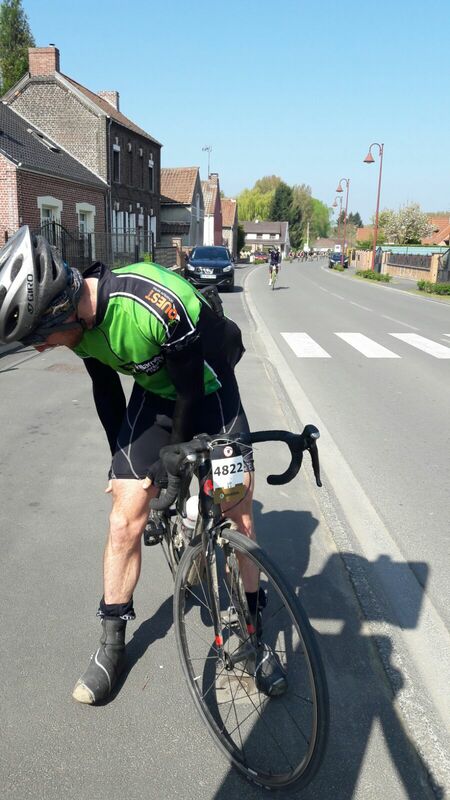 The last 30km, after our last aid station and a quick chat with a lad from dublin, seemed long. The last section of all events feels long though as you begin to tire and think about the chance of rest and food. It felt more like 50km and I believe it was longer than 30. 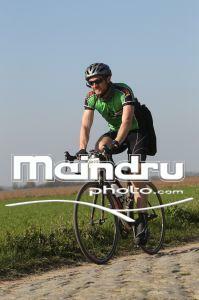 I was really enjoying the day though and the legs were really good. 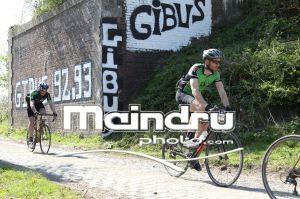 We were beginning to smash through the cobbles and the last grade 5 was good fun. I rode along the verge for most of it, sometimes only twice the width of the wheel up on the grassy edge. It was certainly a test of biking skills and some nerve. We passed some rows of campervans as well as a huge carpark of them. They were fans getting ready for the pro race the next day. The race has a massive following. If you check out the Paris Roubaix website they have some super links to footage on the course. Approximately 9.5hours after leaving Busigny we cruised into the velodrome in roubaix for a velodrome lap. This was an experience in itself. It was a weird sensation and felt like cycling on the side of a hill. We took our time as we really didn’t fancy a fall at this stage. We were no doubt well back in the field as we had taken good breaks and were on one of the last buses to arrive in Busigny. The chance to see and take part in such an event was fantastic. An absolutely massive thanks to David for coming up with the idea to do the event and for keeping the head up when we ran into the bike issues after registration. The bikes were super and we had no punctures all day. Thanks to Prompt CC bike rental company for their help. I will try attach a few videos below to give everyone a bit of an idea for the cobbles. So now it is head in the game for the High Peaks Challenge FKT this day week. No rest for the wicked. Our first press release for the Peaks Challenge. Thanks Team Donegal Oil for being such incredible organisers and sponsors. It is over two weeks now since The Race. It has been a really interesting recovery. This race was far further than anything I have accomplished in the past, therefore the recovery was going to be different and longer. In the end I only really fully stopped for three days. My reason being that we need to keep moving, movement helping the muscles to heal faster. I gradually brought my training back and last Sunday I played a full 90minute soccer match and for the most part felt really good. So what is the key to fast recovery? In my opinion fast recovery is down to, being fit going into the event, fuelling well during the event and post event, rest, eat and hydration are key. The day after The Race my quads were completely shot. Walking was difficult and stairs were really painful. I didn’t sleep well the night after event either. The next few days things improved rapidly and I slept at every opportunity. I was back to running slow 5-6km around town by the following week and managed lots of swimming and a little spinning on bike. The swimming seems to be the perfect recovery activity, activation all the muscles, under no resistance. That along with one of my favourite things, sleep, I’m back to myself and ready for another challenge or two in April. 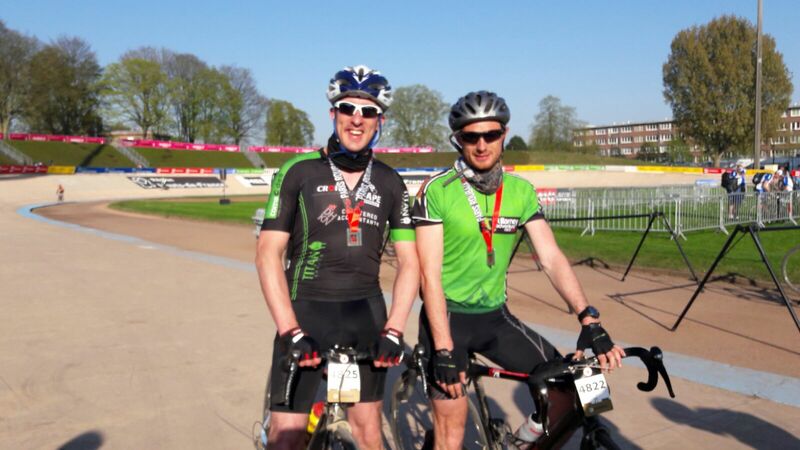 First of all myself and David from work are going to take on the Paris-Roubaix cycle as mentioned in previous posts. The link can be found by clicking above or below. This will give you a feel for the trip ahead. I will blog as we take on this adventure and keep you updated on our survival rate during this tough 172km race over cobblestone. From Paris-Roubaix on the bike to Ireland on foot. The next challenge is a big one. The High Peaks Challenge FKT (fastest known time). Myself and Shaun Stewart are really looking forward to this one. There are talks of an Irish record and a possible Guinness book of records entry, but lets take it one step at a time. No doubt we are determined and we have a crew and a half behind us from a county I know for grit and determination, Donegal! The challenge will see us and our crew of Arthur McMahon, Denis Ferry, Leslie O Donnell, Paul Doherty, Rory Kennedy and Grace Ann McGarvey, drive from one mountain base to the next, covering 26 peaks and the entire island of Ireland and Northern Ireland. The reason for 26 peaks rather than 32 is due to a few mountain peaks bordering two counties at the top. We will be using GPS units on the mountains and all safety gear we need. Our logistical team have vehicles and road routes mapped out and we will be carrying trackers that people can follow online. There are quite a few dot watchers out there at this stage. I’m known to get a little addicted myself from time to time! The details of our challenge, estimated times by road and then on foot will be calculated shortly and details of our charities can be found on the Facebook page or below. We are aiming to raise money for two children’s organizations. These are close to both myself and Shaun and we hope an unusual event, and such a tough event will grab peoples attention. If you follow the High Peaks Challenge Facebook page closely all details of charites and dontaions will be released there and links updated in the coming days. Lakeview School, Play Therapy Galway.